Really nice looking set. The fabric is nice and quite heavy, and the colors are nice. My only gripe is that it seems to attract cat fur, so I always have some kind of lint remover by the bed so I can do a quick swipe before I go to sleep at night - not a big deal! The Newbury three-piece duvet cover set by Porch & Den is a timeless choice for any bedroom needing a quick refresh. Available in a variety of colors with a classic dobby stripe pattern, this set effortlessly blends with existing design themes to create a stylish sleep haven. Crafted with hypoallergenic double-brushed microfiber materials, the duvet cover and shams are soft to the touch and machine washable for your convenience. I ordered two of these and am delighted with the look and quality. I wanted a cover that was easy care but that looked elegant. The subtle stripes in the material are the perfect touch. Delighted with my purchase! So soft!! I have been ordering from overstock for two years. Never dissatisfied. I ordered the grey ones. Perfect color. Thinking about getting a second color..Super soft!!!!! This is a beautiful, soft Duvet cover. The stripe is subtle but looks elegant. Very nice quality. The duvet is better than I expected. I am using the duvet to cover a printed quilt. The fabric is thick enough that the pattern on the quilt does not show through. I ordered the aqua. It looks more like robins egg blue. That was the one disappointment. What a great buy. Great color, soft quality fabric. A duvet cover set I would highly recommended! This duvet cover was definitely worth the value for the money I spent. Normally I like to purchase locally so I can feel and touch the fabric, but it's not even possible to find duet covers in a store locally. This duvet cover met all my expectations. Very nice feel and richer looking in person than in the picture. I did have to spend some time ironing out the wrinkles, but that's to be expected. This duvet set is beautiful. The stripe pattern makes it look very expensive. I bought brown and it was perfect for the colors I have in the room. And it is soft. I would recommend this set. Love the look of my new duvet cover set. Very attractive. Overall, I really liked this duvet cover. It was soft and easy to put on my down comforter. However, I have 2 cats and every piece of cat hair stuck to my navy blue comforter cover. LOVE, LOVE, LOVE this Duvet Cover. Seems like a rather innocuous purchase right? Wrong! The Comfort and Quality of this one shines through, I am not sure what you are looking for in a Duvet cover, but we wanted it to 1) Look Good (It DOES!) and 2) Be Comfortable (IT IS!). I love the color as well. Great Purchase as this was also at a great price! Good cover set for the price! Darker in color as shown, everything included as described, light, for the price cannot beat it! Only con is that if you have a pet, it attracts pet hair. I love the color and the dog's fur does not stick to it. Great price, too. Overall it's what I needed. It's comfortable, lightweight, and luckily matches my accent pillows nearly perfectly. I'd prefer a zipper closure to the button and eyelet fasteners it has but so far they have been fine. My package came unharmed so not sure what the other review was about, but came zipped up packed perfect. Could use a few more buttons, but for the price its really soft and is a great deal! My product drive prompt however the packaging was quite unpleasant. The plastic protective casing was ripped and damage. I normally wash new linens but I was still put off that the product was sent in such a condition. The quality of the product is good, though stripe pattern is not as bold as the picture appears. Still great product an would recommend purchasing. Great quality, stitching holds up. I was concerned with the durability, as we have two very large dogs and they often snag blankets with their paws. I havent had that issue with this set. Can't beat the price. These are very soft and it is a true navy (not the electric blue portrayed online). This was the perfect option for our guest room. Perfect color that we wanted! Perfect for a cal king duvet! There really isn't much that can go wrong when you purchase this kind of product. I got exactly what I paid for, color size and look are everything I expected. "The gold picture looks like a light orange. I would order one if that was true. Is it an orange shade?" No, it is a bit more yellow in person. "Does the navy look navy and not royal blue like the picture? " "I purchased the Sage and Burgundy and have great difficulty seeing the stripes in the fabric, unlike the photo's. Is this the case for others who purchased this item. Thank you for your comments." Yes, it is hard to see the stripes, but its super soft, so I don't mind. Stripes are very hard to see. "Does this cover has a sipper?" No, it has buttons to close the duvet cover. You have to push the pillows into the shams. "When will white be available?" Unfortunately, we do not have a restock date for this item. We apologize for any inconvenience. "What is the thread count?" This microfiber set feels very high quality but it is fairly lightweight. Do they do threadcount on microfiber? Regardless, I love the Ivory set so much that I purchased a second set in gray. "What is the weight for a king size duvet cover?" 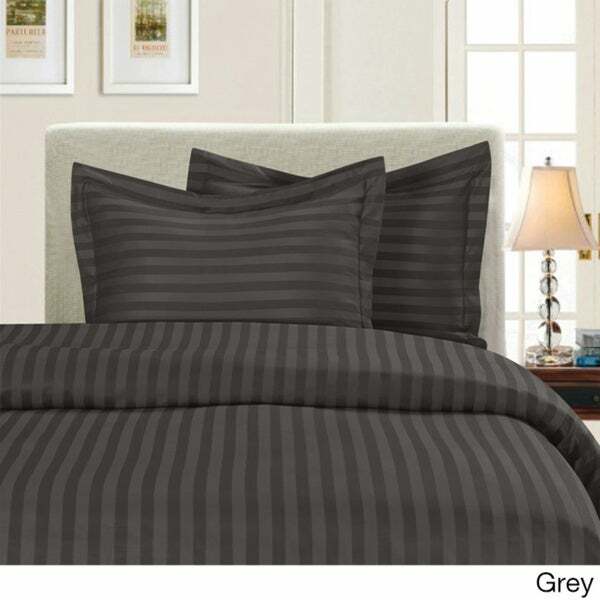 Hello trueshopping, thank you for your interest in this duvet set. This is approximately 3 pounds. Have a great day!